This is the second report in our series A Guide to Entering China for Foreign Brands and Retailers. 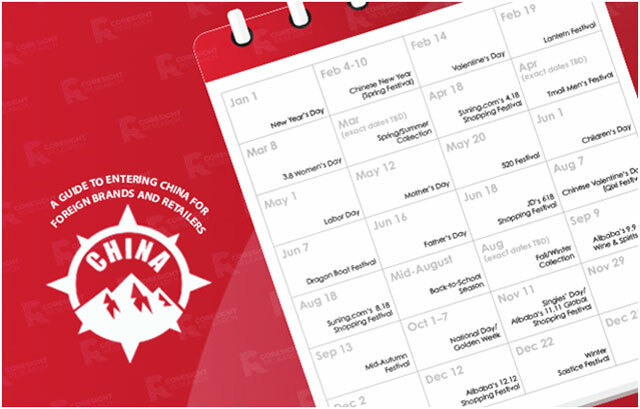 Here, we focus on important dates on the Chinese calendar that foreign brands and retailers should consider as they create specific e-commerce marketing strategies and offline expansion plans for the Chinese market. Following Alibaba’s extraordinary success in turning Singles’ Day into a shopping extravaganza, other shopping festivals in China are growing in importance as companies look to spread out higher sales throughout the year and distribute operational costs more evenly. Some Western holidays are celebrated quite differently in China. International Women’s Day, for example, is celebrated with the 3.8 Women’s Day shopping festival, which features heavy promotions and discounts targeted toward female consumers. The biggest holidays in the Western world are less widely celebrated in China, but many of them represent good opportunities for foreign brands and retailers to promote their products to Chinese consumers. Traditional Chinese festivals emphasize family bonding and Chinese culture. Most of these are good opportunities for branding or promotions, but not all of them are. Brands and retailers that can create marketing strategies that leverage specific festivals will be poised for success. Chinese e-commerce has become a phenomenon in part due to the sheer size of China’s population. International brands and retailers that want to enter and thrive in the Chinese market can benefit by learning about the country’s traditions and culture and how they may affect a company’s marketing strategy. In this report, we discuss the holidays and shopping festivals in China that foreign brands and retailers should pay attention to, ranging from traditional cultural celebrations to holidays adopted from Western culture to special events recently created by retailers and e-commerce platforms. We also provide guidance on how international companies can best market to Chinese consumers during these special times of year. Alibaba has turned its Singles’ Day shopping festival (officially called the 11.11 Global Shopping Festival) into an extraordinary success, and the event generates massive sales in a single 24-hour period each year.But most brands and retailers would prefer to spread out higher sales throughout the year instead of having Singles’ Day account for the bulk of annual revenues, in order to more evenly distribute the cost of operations. That’s one of the reasons other shopping festivals in China have been growing in importance in recent years, and also why retailers and e-commerce platforms have created many new shopping events. 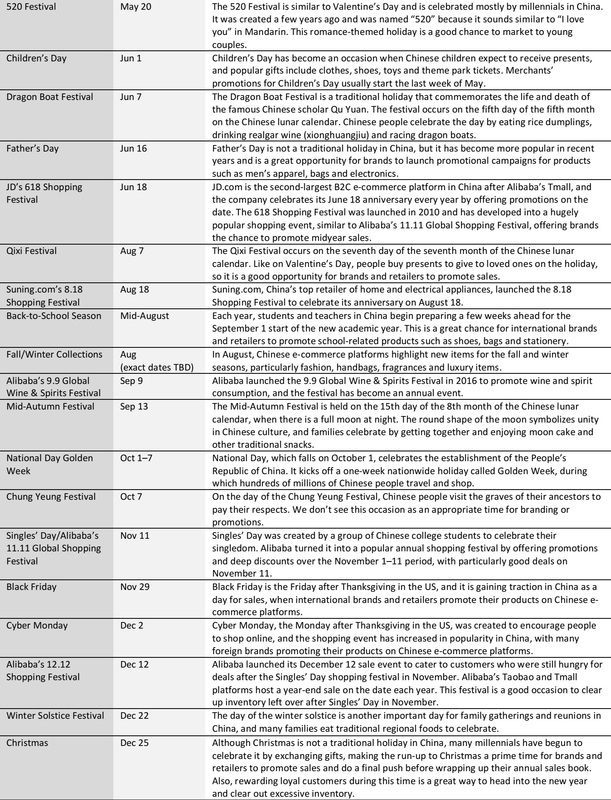 To download a one-page timeline of key festivals and holidays in China in 2019, click here. Some holidays and events celebrated in Western cultures have been popular in China for decades and have evolved into shopping festivals more recently. But many of these are celebrated differently in China. International Women’s Day, which falls on March 8 each year, is a good example. The day celebrates the social, economic, cultural and political achievements of women, but in China, the celebration is coupled with heavy promotions and discounts targeted toward female consumers. Tmall runs a Queen Festival sale in March to celebrate women, while JD.com offers the Butterfly Festival, and it’s common to see women queuing in lines to participate in 3.8 Women’s Day sales in Chinese shopping malls. This presents a rich opportunity for brands and retailers that sell products for women, especially beauty and skincare, home necessities, and apparel. According to data company ECdataway, apparel, shoes and bags, and beauty and personal care were the categories that generated the highest revenues during Tmall’s Queen Festival this year, which ran March 5–11. Apparel, shoe and bag sales totaled approximately ¥8 billion ($1.2 billion) over the sale period, and beauty and personal care sales approximately ¥3.3 billion ($0.5 billion). According to data firm Kung Fu Data, Taobao and Tmall generated ¥30.8 billion ($4.5 billion) in gross sales of items such as women’s fashion, accessories and cosmetics on 3.8 Women’s Day in 2017. Christmas and New Year’s Day, perhaps the two most important holidays in the Western world, are less widely celebrated in China, although more Chinese millennials have been dressing up and attending parties and gatherings on Christmas Eve and New Year’s Eve in recent years. Also, a few shopping malls in tier 1 cities have begun putting up holiday-themed decorations and running related promotions during the Christmas period. In coming years, these two winter holidays could present increasing opportunities for brands and retailers looking to promote foreign products to younger generations of Chinese consumers. Black Friday and Cyber Monday were also not traditionally celebrated in China, but in recent years, more foreign brands and retailers and e-commerce platforms have used these Western shopping holidays as opportunities to market foreign products to Chinese shoppers. 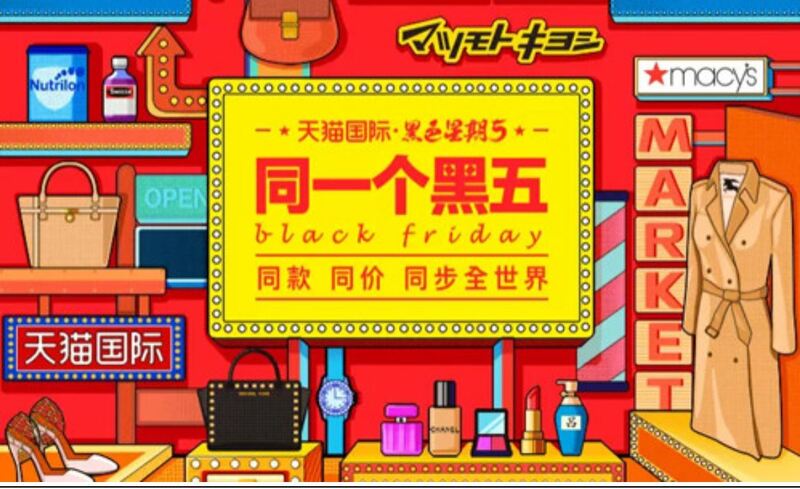 Alibaba positions Black Friday as the “same Black Friday globally,” and offers Chinese consumers the same discounts on many of the same products that are on sale in the Western world on Black Friday. In 2016, Alibaba began cooperating with US retailers including Costco and Target to promote Black Friday sales. Mother’s Day, Father’s Day and Children’s Day are other holidays that foreign brands and retailers can leverage to promote mother and baby care items, men’s fashion and grooming items, and toys, respectively, to Chinese consumers. According to Kung Fu Data, Alibaba’s platforms generated ¥7.4 billion ($1.1 billion) in gross sales of items such as toys, board games, and children’s apparel and shoes on Children’s Day in 2017. There are a number of significant festivals in China that are culturally meaningful. Many of these are good opportunities for branding or promotions, but not all of them are. Chinese New Year, or the Spring Festival, is the most important festival in China. The holiday celebrates the beginning of the lunar year, which normally falls in January or February. Chinese families celebrate the New Year with gatherings and reunions, and many people distribute red envelopes, symbolizing blessings, to each other. Celebrations also often include fireworks displays and special snacks or steamed New Year’s cake (niangao). Chinese consumers by the tens of millions have migrated to top-tier cities for work, but almost all of them go back to their hometowns to gather with their families for Chinese New Year. Data from the National Bureau of Statistics of China reveal that there were approximately 77 million interprovincial and 95 million intraprovincial migrant workers in 2017. Shenzhen’s population last year reached 12.5 million, but only 4.3 million people were permanent residents, meaning that immigrants make up almost two-thirds of the city’s total population. For foreign brands and retailers, the important takeaway from these figures is that top-tier cities see much less traffic over Chinese New Year, while lower-tier cities see much more, as so many workers travel home to be with their families over the period. Another thing to note is that Chinese consumers normally shop for every item they need before the Chinese New Year, so they can maximize their time with family and friends over the holiday. When Chinese New Year begins, sales practically stop and couriers and most customer service agents go on holiday. Therefore, brands and retailers should plan to start their holiday marketing campaigns well before Chinese New Year celebrations begin. In 2019, the Tmall Global Spring Festival campaign will likely start the week of January 7–13 and wrap up the week of January 14–20, well ahead of Chinese New Year, as cross-border e-commerce orders normally take longer to ship. Tmall’s domestic campaign will likely start about a week later. Merchants can expect a very quiet two weeks as the Chinese New Year begins, and sales targets during the period could be near zero. National Day Golden Week begins on October 1 with National Day, which celebrates the establishment of the People’s Republic of China, and the period represents another significant shopping occasion in the country. Chinese consumers are given one week off for this important event, and it is seen as one of the best times to travel, either within China or abroad. Chinese shoppers tend to spend enthusiastically at home and overseas during Golden Week, so it’s a good time for brands and retailers to offer promotions in shopping malls and at tourist destinations in China as well as in the US and Europe. Labor Day, which falls on May 1 every year, used to be another holiday that was celebrated in China with workers being given a full week off. The holiday period was officially shortened to three days in 2008 and then to one day in 2014, but many employers still give workers a three-day holiday around May 1. Therefore, Labor Day is another prime time for Chinese consumers to go on vacation. The traditional and most widely recognized Chinese holidays celebrating love are the Qixi Festival, which falls on the seventh day of the seventh month of the Chinese lunar calendar, and the Lantern Festival, which falls on the 15th day of the first month. Another romance-themed holiday that has become popular in recent years is the 520 Festival, which falls on May 20 (in Mandarin, “520” sounds similar to “I love you”). Valentine’s Day is not as widely celebrated in China as it is in the West, but it is popular among young Chinese couples and offers brands and retailers a great opportunity to promote gift items, particularly gifts for women. According to Kung Fu Data, on Valentine’s Day in 2017, Taobao and Tmall generated ¥6.2 billion ($911 million) in gross sales of flowers, bags, and women’s shoes and accessories. Chinese culture values family bonding, and a number of festivals, including the Lantern, Dragon Boat, Mid-Autumn and Winter Solstice Festivals, focus on celebrating Chinese values and family. We see these festivals as good opportunities for companies to undertake branding efforts that align with Chinese values and customs rather than as good times to offer deals and promotions. Two other Chinese festivals, the Qingming Festival and Chung Yeung Festival, are occasions when Chinese people visit tombs and cemeteries to pay their respects to their ancestors and, so, are not appropriate times to launch either branding or promotional efforts, in our view. Chinese retailers and e-commerce platforms have created a number of shopping festivals to keep consumers engaged throughout the year. The most remarkable one is Alibaba’s 11.11 Global Shopping Festival, which takes place on Singles’ Day, November 11, every year, with many deals offered in the days before. This shopping extravaganza began in 2009 and has become the world’s biggest 24-hour online sale. Numerous domestic and international brands join the sale via Taobao, Tmall, Tmall Global and AliExpress, and sales smash records every year. In 2011, Alibaba launched the 12.12 Shopping Festival (held on December 12) as an extension of Singles’ Day. The festival offers a chance for merchants to clear up inventory left over after the November 11 sale and gives small and medium-sized businesses an opportunity to shine, as they’re often overshadowed on Singles’ Day by large brands offering deep discounts. However, the 12.12 Shopping Festival does not generate as much attention as its 11.11 counterpart, as it’s considered more a sequel event than a unique festival with a specific theme. JD.com created the 618 Shopping Festival in 2010 to celebrate its June 18 birthday (the company was founded in 1998). The June sale has become an important midyear event, with retailers and other e-commerce platforms carrying out promotional campaigns and offering deep discounts. In 2018, JD.com’s sales transaction volume during the June 1–18 event reached a record ¥127.5 billion ($20 billion). 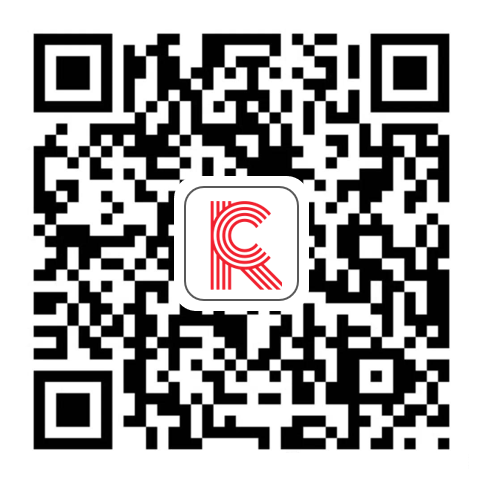 Suning.com, China’s leading appliances and electronics retailer, launched the 8.18 Shopping Festival in August 2014. The annual online-to-offline sales event features discounts and promotional campaigns across Suning.com’s domestic and international retail channels. In 2018, the 8.18 Shopping Festival hit a new record, with sales up 155% year over year. The Tmall Men’s Festival, which usually takes place in April, offers sales on products typically bought by male consumers, such as briefcases, electronics and men’s apparel. Alibaba’s 9.9 Global Wine & Spirits Festival promotes the consumption of wine and spirits. According to Kung Fu Data, the first 9 Global Wine & Spirits Festival in 2016 generated ¥1.9 billion ($280 million) in sales. com’s 4.18 Shopping Festival promotes home appliances and electronics products on April 18 each year. These are just a few of the festivals created to promote specific products. The mid-August back-to-school season offers e-commerce platforms another chance to promote specific product categories, such as shoes, bags and stationery. International brands and retailers seeking to promote specific products to Chinese consumers can cooperate with their operating partners and e-commerce platforms in China to leverage these and other newly created shopping festivals. 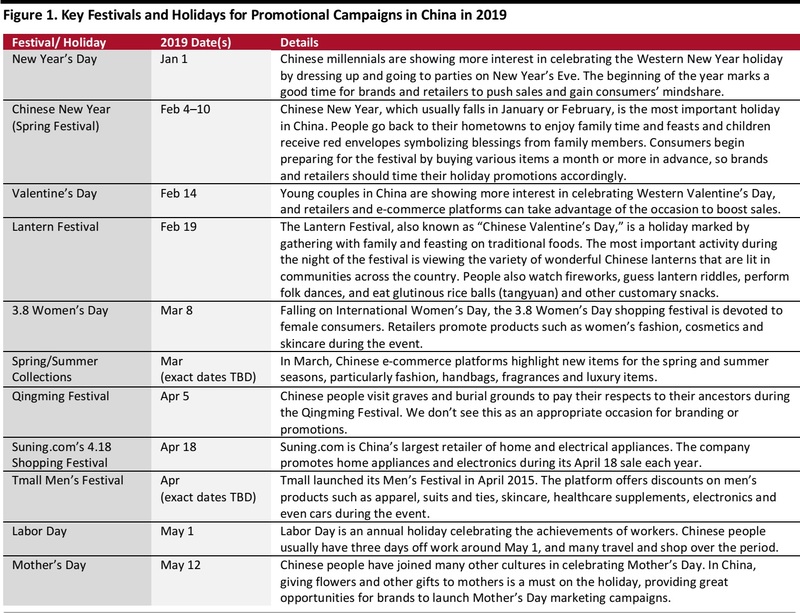 With 2019 almost here, brands and retailers selling in the Chinese market must plan now to ensure that their branding and promotional efforts are timed to align with Chinese holidays and festivals. We see the retail focus shifting from achieving an eye-popping sales figure in one day on Singles’ Day to distributing sales more evenly across the year via a variety of Chinese shopping festivals. Brands and retailers that understand Chinese culture and values, and that design specific marketing strategies that align with them, will be better positioned for success than will those that attempt to market in China the same way they do in the US or Europe.